Have some time to waist? Maybe you're waiting to be seated at a restaurant, sitting quietly in church, or waiting in line. Challenge those around you to this simple classic game of Tic-Tac-Toe. "Loads Fast! I love it." 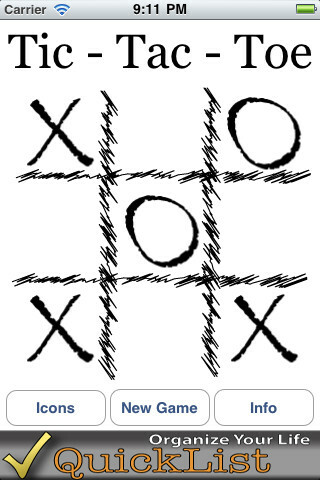 Tic-Tac-Toe is a simple two player game. Try to get three in a row, and block your challenger at the same time. While the concept is easy, it is difficult to master. Tic-Tac-Toe features 9 unique playing pieces and a unique style that makes you feel like you're still playing on paper. "Now I can save trees and not play this on paper."